Do Strawberries Take a Year to Produce Fruit? Q: Do Strawberries Take a Year to Produce Fruit? Answer to: Do Strawberries Take a Year to Produce Fruit? Thanks for stopping by! 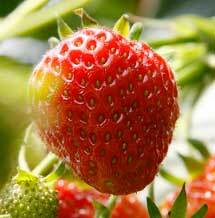 Generally, strawberry plants do take about a year to really begin producing good fruit. If you planted a June-bearing variety (see the Strawberry Varieties reference page, if needed), it is best for the long-term health of your plants and for the yield in future years to completely do without strawberries in year 1 by pinching off or cutting off all of the strawberry flowers. This helps the plants become well-established and increases their overall vitality. If you planted a day-neutral or everbearing variety, the flowers should still be pinched initially, but strawberries can usually be harvested later on in the season. Sometimes, however, small and misshaped strawberries can be due to other factors. On that, see this page on deformed strawberries. There are a host of other factors that could affect strawberry production as well: soil pH, type of soil, amount of sun, etc. 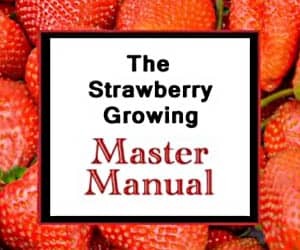 If you haven’t had a chance to visit the Growing Strawberries reference page, it has a lot of information that may help you! If you have any other questions, feel free to ask. Hopefully that helps! Strawberry Plants .org exists to help spread the passion for growing and eating strawberries. However, manpower is limited. If you have a question related to strawberries, feel free to submit it or post it as a comment. Please be patient, though, as it may take some time before your question is addressed. Growing up in Wisconsin, as a home grower I recall Sparkle as a *stand-out* strawberry for incredible sweetness and flavor. The drawback I found for this variety was a relatively small berry size and declining berry size during the season compared to other varieties. Nonetheless, the taste was worth it. Now, I live in southern but non-coastal Mississippi. Can your recommend a great flavored strawberry for the hot, humid deep south? Mississippi State University and the University of Arkansas studies provide some indications, but their primary focus is on commercial strawberries, which look good in the store but, IMO, never come close to the fresh eating flavor intensity and quality of Sparkle. Thanks for the answer to my question. If I put the plants in the sun room and they do not go dormant, will they produce strawberries next summer? If in the garage with no heat, how often to water to prevent the roots from getting dry? Depending on the variety, they may or may not. You might have a smattering of berries throughout the winter, but they will likely be small and sparse without the normal daylight hours. The perennating buds that turn into strawberries during the spring are formed in the crowns of the plants during the fall. As such, yours might begin to produce a bit earlier, but will likely have a smaller crop without optimal conditions. If you store them in the garage, just check the soil periodically and make sure that the soil isn’t dry to the touch. It should remain moist enough to keep the roots from drying out. Good luck! I live in Bend Oregon with harsh winters. My strawberry plants are in a large laundry sink with good drainage. I can move them into a non heated low light garage for the winter. If so, will the plants need any water from october to April? I also have a sun room that never gets below 45 degrees and has very good eastern and southern light. If I put the strawberries in that room, do they need to be watered? Yes, the strawberries will need to be watered in either place. If the temperatures don’t drop below 45 degrees in the sun room, they may not even go dormant. Even in the garage, however, the plants require watering periodically as they will die if the roots dry out completely. Good luck! I live in Winnipeg Manitoba it is the end of September the weather still nice I have a bunch of ever-ready berries that I would like to move from a low spot to a higher spot so they don’t get washed out in the spring thaw . When is the best time to do this? If I plant a strawberry plant in june what is the time period it will take to genrate fruis? This should help you: growing strawberries. Good luck!